It would be an omission if nicknames were not included as this was part and parcel of Addiewell life. Most amusing they were, with some given here: Soda, Jammer, Tackie, Badger, Duke and Tookie : all characters who contributed to give Addiewell its pawky humour and character. It was one of these same labourers who arrived a work one morning with a neat patch in the seat of his trousers, and in the centre of the patch was a button. (In those days, patches, with a button attached, were supplied with each new suit of clothes, and in her haste to patch the man’s trousers, his wife had forgotten to remove the button.) The quick witted navvies immediately dubbed the man “Button” and the name stuck for more than one generation. If you remember other nicknames from the old days, add them to the website, or contact us and we’ll add them to this page. 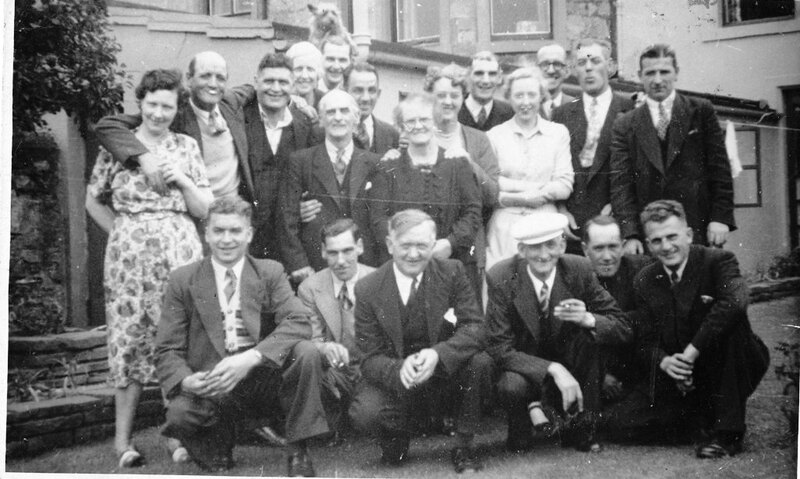 A Loganlea pub trip in the 1950s? Back Row (L-R): Peter Corrigan ? ; two unknowns; - Dougan; Andrew - ; Johnnie Kelly; T.B. ; Billy Smith. Front (L-R): Hughie Brown; Paddy Mulligan; Willie Walker; Jock Walker; Dan McGuigan; Danny Young. West Lothian Local History Library. All rights reserved. S1. 223. This page was added by Sybil Cavanagh on 06/06/2012. Growing up in Addiewell in the 1960s I can recall hearing these nicknames of local people: 'Jigger' Paton, 'Juicy' Kane, 'Bub' Corrigan and Ding.